So far the blog tour celebration has been exciting! To check out the rest of the posts in the tour, click here. Today I’m going to share with you where I got the inspiration for the setting in Dare. When I describe the setting for Dare, I describe it as American West meets medieval or South Dakota with castles plunked into the middle of it. When I began writing Dare, I knew I didn’t want the usual, European geographical setting. I wanted something different. And that’s when I remembered a camping trip from a number of years ago. 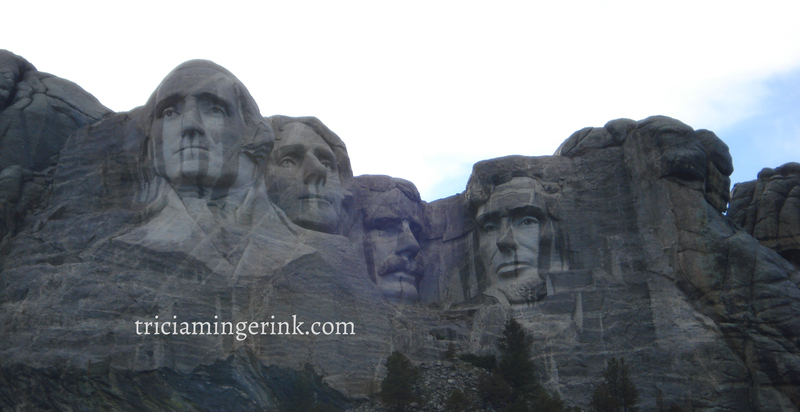 My family and I were on our way back from Yellowstone when we swung through South Dakota to see Mount Rushmore. It had rained a few hours before, so it looked like George Washington was in serious need of a handkerchief. After we stared at Mount Rushmore sufficiently long enough to ingrain it in our memories, we piled back into our suburban and punched Custer State Park into the GPS to find our campsite for the night. It was about 6 in the evening. All of us were hungry. All we wanted to do was get to a campsite so we could set up our tents, eat, and go to sleep. We didn’t know, however, that the GPS automatically routed us to the middle of the state park, not the entrance to the state park campground. For those who don’t know, Custer State Park is huge. 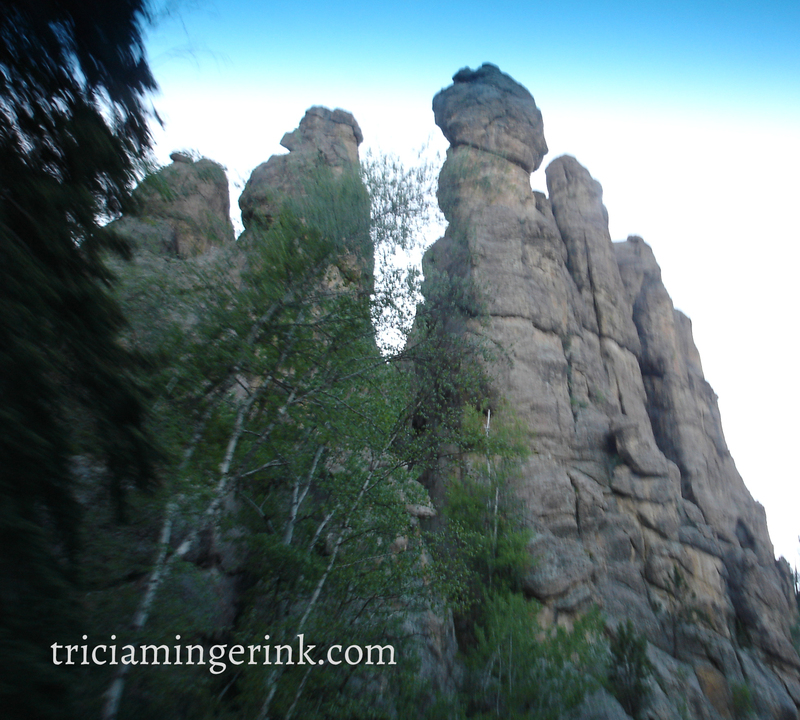 It’s filled with twisting roads winding up, down, and around through the Black Hills. We drove and drove and drove until we finally realized we were lost. We were somewhere on a scenic route with sections of one-way road between these sharp peaks. We were truly lost. We spent hours trying to find our way out of this maze of scenic roads. Finally, at about 10 at night (yes, we’d been lost for four hours), we discovered we’d gotten out of Custer State Park and stumbled across a small campground called Horse Thief Resort. We had to set up our tents and eat a quick meal in the dark. But at that point we didn’t care. It was a pretty memorable adventure. The scenery of South Dakota stuck with me, so when I was thinking about interesting scenery for Dare, I decided that the South Dakota/Nebraska area would be perfect. How many medieval fantasies also have prairies and western-style saddles? I modified the geography so Acktar isn’t exactly South Dakota, but it does resemble it. The Spires Canyon in Dare is named after and based on the tall spires of rock my family saw while lost in Custer State Park. What about you? Any family vacation stories to share? 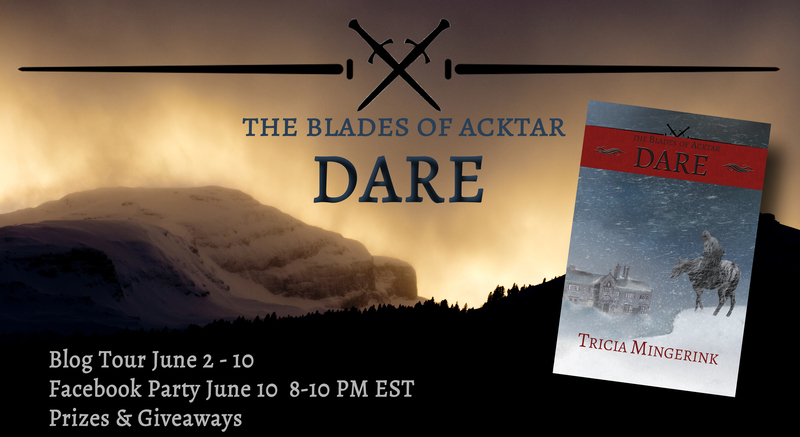 All through this week, I’m holding a giveaway to celebrate the release of Dare. Click here to find where to enter or enter from any of the posts along the blog tour. Yes! The blog tour has been excellent! I’ve really enjoyed all the posts. Hmm…I’ve been on a lot of vacations with my family, but no something-goes-wrong stories come to mind at the moment. The closest I can come up with is when my parents, my older-younger brother, and myself went zip-lining in Jamaica. It was awesome, but the drivers in Jamaica are nuts. To quote one of the employees at the zip-line “Drive like you stole something!”. It’s a little thrilling when the road takes you next to a cliff, lol. I’ve heard that about Jamaica before. It does sound like an adventure! My family tends to be the things-go-wrong-on-our-trips variety. Blizzards in Yellowstone, lost in South Dakota, tornadoes, engine fires, torrential downpours…but, hey, we always manage to have fun while we’re at it. Probably because we see it as an adventure rather than a disaster.